Challenge: Create a website to give developers the tools to create apps for Sprout, utilizing it’s unique features. Sprout by HP highly encourages developer engagement in creating new applications that utilize Sprout's unique capabilities, including 3D scanning, a touch-capacitive mat, and more. 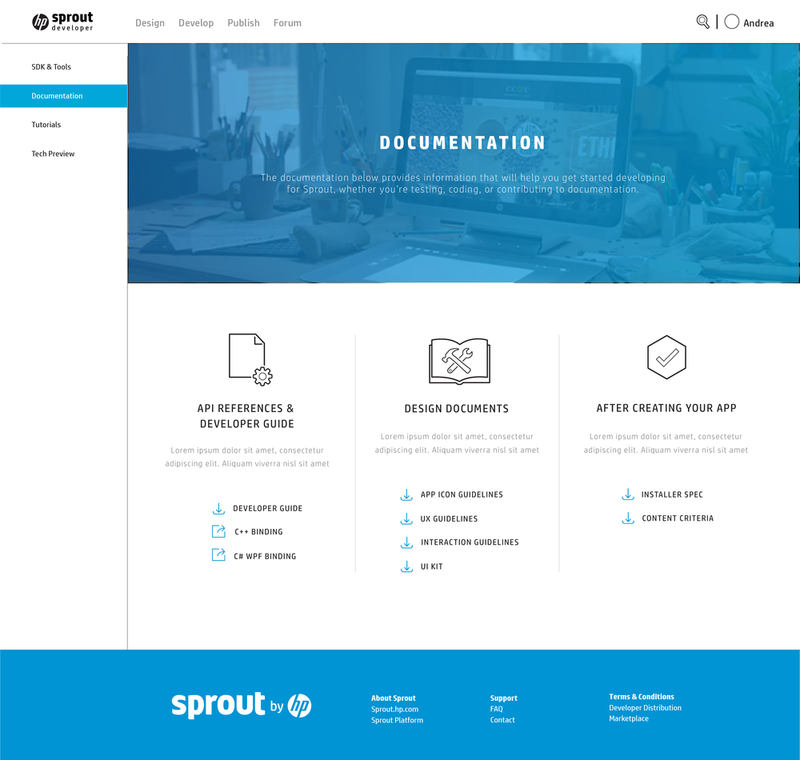 I was tasked with redesigning the developer portal, where developers can come to gather and share information on Sprout for the purpose of creating new apps. At the time of this website design, the SDK was free to use for any developers, so we needed to provide them with all of the necessary documentation and downloads in order to build applications. I organized the website by priority over what documents the developers needed to see first to get started, and then drilled down into the more complex issues in deeper pages. There were a ton of assets and features that needed to be considered when building out the site. This included things like tutorial videos, code examples, API documentation, and community-contributed content like a blog. From the homepage, we decided to include links to the Develop section, Design section, Publish, Forum, Events, and Login. Develop would be composed of articles, downloadable documentation, examples, the SDK, and an in-depth ‘Getting Started’ for how to set up and how to start coding. As part of the redesign, I created all of the icons and illustrations for the site. These icons went through several iterations in order to convey the correct meaning for sometimes confusing terminology. Throughout the whole development of this site, I had weekly meetings with the front-end and back-end developers, QA testers, product owners, and more. We worked in an Agile development process, with two-week sprints. The requests and bugs were filtered through JIRA, which was our tracking software. This website went through many iterations, and was reviewed by lots of managers and developers who wanted input. This project was quite a beast since there were a ton of pages to design, including Home, Forum, About, FAQ, Developer Page, Member Center, Publish, etc.